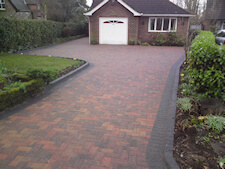 A beautiful driveway will prove a significant asset, designed to complement your home and add value to it. Maybe you want to enhance the kerb appeal of your home, additional parking spaces, more room to carry your shopping past your car to your front door or you are concerned with flood risk and planning permissions and want a more sustainable solution. Paul Gibbons Landscapes Ltd can guide you every step of the way providing you with ideas and designs, tones, textures, style and colourways to suit your property and its surroundings, any number of quotations for those options, and a good quality service with as little disruption as possible during installation. We want you to be fully satisfied with our work and will not expect final payment until the project is completed to your full satisfaction. We supply a 5 year guarantee on all our work. 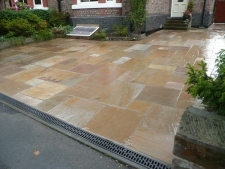 We work on a supply and install or install only basis, and will install any type of paving products of your choice. Many can be seen in building merchants, specialist paving centres and DIY stores. 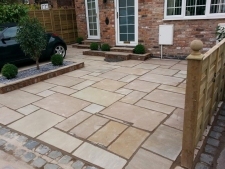 We prefer to use paving products that reflect the quality of our installation to suit any purpose, any property and any budget. 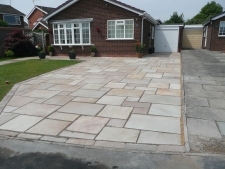 We can source and lay the vast range of driveway products on the market, including block paving in its wide and varied selection of design and colour, indian stone, the huge range available of decorative paving, driveway gravel or stone chippings. 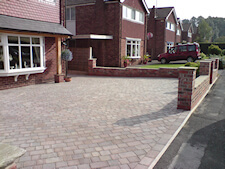 Two manufacturers of quality paving products are Marshalls and Brett (formerly TopPave). All their products are manufactured to the appropriate European Standard where applicable and to the highest standards. They provide guarantees for their products and are committed to quality and innovation. Their products can be chosen out of their catalogues available in most builders merchants or samples from us on request. 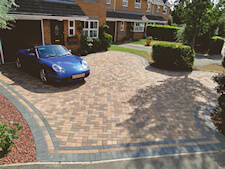 Britian’s top selling driveway, a solid reliable block paving made to last in a wide range of colours with matching channels, kerbs and edgings. A tumbled cobble with a riven surface and a delicate shimmer that makes a great alternative to granite setts, a style reminiscent of old cobbled courtyards. 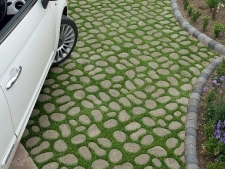 The cobbles can be laid in victorian weave design and are available in 3 colours with matching circle kits and kerbs. 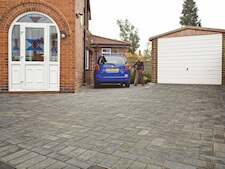 Drivesett Savanna is a great value, hardwearing block that is available in three sizes so can be laid in different patterns. It is available in three colours so it can enhance different kinds of properties. 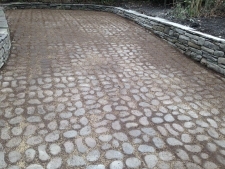 Marshalls have created this wonderful product to provide a cheaper alternative to real cobbles. It has a contoured base to ensure a realistic antiqued cobbled look. It comes in a variety of sizes and profiles as well as colours so it ensures every project using Original Cobble will enhance the property’s character and charm. 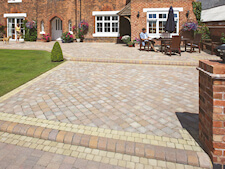 Bioverse is a permeable paving so no planning permission is needed to use this product on your driveway. It is ideal to use to create additional parking space whilst retaining the environmental benefit of a decorative grassed area. It is available in two colours. Indian stone has become more and more popular over the last few years. 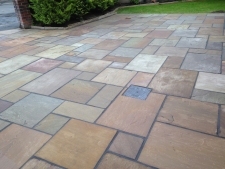 It comes in a range of colours so it can suit any property and can look great alongside other paving. As it is a natural product, when it is cleaned it looks like new. It is strong enough to be used for driveways as well as paths and patios.